Sometimes you just wanna get away from it all, bury your toes in the sand, and chat with the creators of Job Simulator about their follow-up game. Now that E3 2018 is nothing but a fading memory in the rearview mirror the team here at Shacknews sure could use a vacation. But, the video game industry never sleeps, so it looks like we’re outta luck. 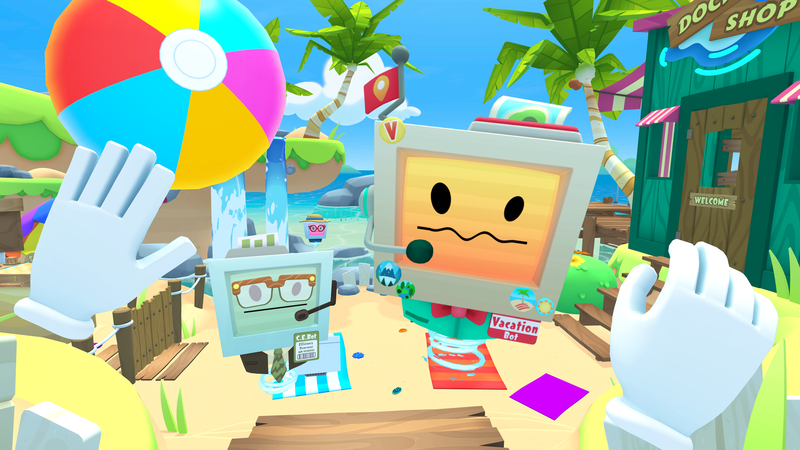 Although if the team at Owlchemy Labs has anything to do with it, we’ll at least be able to take a brief VR excursion to relaxation with their upcoming game, Vacation Simulator. Following up on the success of their smash hit Job Simulator, Vacation Simulator seems like the perfect next step for the team’s interactive and quirky gaming style. We had a chance to catch up with the Owlchemy Labs team at E3 2018 to ask them about what they learned working on Job Simulator and Rick and Morty: Virtual Rick-ality, how things have changed for the team now they’re part of Google, and the unique challenges of developing for multiple VR platforms. Check out the video below for the whole conversation and be sure to keep an eye for a special cameo from our own Greg “Burkleton!” Burke at some point during the interview. Vacation Simulator is set to launch later this year for Oculus Rift, HTC Vive, and PSVR. There’s no word on an official release date just yet though.